COLSTON’S Girls’ School is celebrating a fantastic set of A level results with many exceptional individual performances. 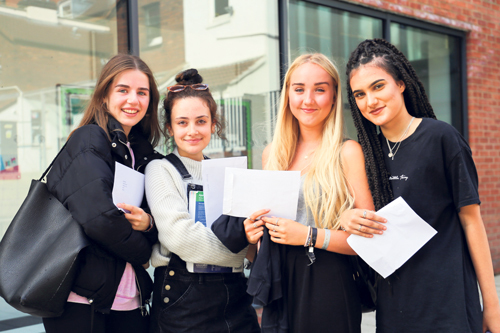 Three CGS students who all achieved perfect A/A* grades will be studying at Exeter University: Emma Hilton (A*A*A*A) will read Mathematics; Ellis Deeny (A*A*A and A in the Extended Project Qualification) will read Liberal Arts with study abroad; whilst Emily Craner (A*A*A) will read English. Almost one quarter of all results were A/A*, 58% were A*-B, 79% A*-C and 96% A*-D.
Other achievements include Emilie Farrow (A*AB and B in the Extended Project Qualification), who will read Fine Art at De Montfort University; Mawadah Mohammed Odeh (A*AB), who will read Law at Bristol; Hanna Paul (A*AB) who will read Architecture at UWE; Monika Sandhu (AAA), who will read Forensic Computing and Security at UWE; Jodie Miller (AAB) will read Russian with Czech at the University of Sheffield.